Truly you are a God who hides himself, O God and Savior of Israel. The preacher, in speaking of the dark days, of which we were to expect our share, bade us look to an unknown friend, and I glanced up inquiringly for further particulars of this mysterious and influential patron who chose so strange a way of announcing himself. Reproachfully, and with peculiar emphasis, the pastor then pronounced the name of this unknown friend: Jesus. At this, they picked up stones to stone him, but Jesus hid himself, slipping away from the temple grounds. Revered by Gordon as the risen Lord. The hidden friend of Variation XIII has mystified and divided Elgarians for well over a century with the most popular theories favoring Lady Mary Lygon or Helen Weaver. Following the discovery of the hidden Principal Theme (Ein feste Burg) and the Enigma cipher, however, both parties are thrust squarely out of contention. The first word of the ‘dark saying’ unveiled by the Enigma cipher confirms the secret dedicatee is not a Lady, but a Lord – the Lord. No wonder Elgar designated the earliest known version of this variation with a single capital L. The twelfth letter of the alphabet is phonetic for the Hebrew word El (אל), a generic form of the word God. Subsequent sketches include after L the letters ML. Those are the initials for the composer of Ein Feste Burg, Martin Luther. Some misinterpret the LML amalgamation as a reference to Lady Mary Lygon, something Elgar encouraged in later life, but that is not the case at all. Nicolas Reed correctly observed Elgar was in the habit of annotating sketches long after completion, and ML was only added years after the fact to comport with the popular theory then championing Lady Mary Lygon. Such a form of misdirection proved to be an effective strategy for sending sleuths after spurious leads, thereby ensuring the dedicatee remained a secret during Elgar’s lifetime. There is a much deeper, literary meaning attached to the initials LML based on their Roman numeral values (L = 50, M = 1000), a subject explored more extensively here. Suffice it to disclose for now the Roman numeral values for LML allude to the enigma forte ('difficult enigma') of Dante's Divine Comedy, the mysterious "Five Hundred, Ten and Five" foretold by Beatrice in Canto XXXIII of Purgatory. Did we in our own strength confide, our striving would be losing; Were not the right Man on our side, the Man of God’s own choosing: Dost ask who that may be? Christ Jesus, it is He;Lord Sabaoth, His Name, from age to age the same, And He must win the battle. Elgar’s hidden friend was all but an open secret. He could be none other than his Lord and Savior according to his public profession of faith as a practicing Roman Catholic. Elgar dedicated the majority of his works to God, so this possibility should have been seriously contemplated by scholars ages ago. Ian Parrott was a lone voice in the wilderness with his discourse on 1 Corinthians 13, the famous “love” chapter recited at weddings. In the final verse (the thirteenth), it lists the three theological virtues – faith, hope and love – concluding “the greatest of these is love.” Knowing the true identity of Elgar's hidden friend, the initials LML may be interpreted as the initials for three famous titles given to Jesus: Lamb, Messiah, and Lord. The number for Variation XIII alludes to the identity of the hidden friend. Consider these parallels – thirteenth chapter, thirteenth verse, thirteenth variation. The Roman numerals X and III are graphically portrayed in the insignia for the Society of Jesus, the Jesuits. The cross resembles the X, and the three nails the three I's. It is tantalizing to imagine the missing three letters for this movement are I.H.S. The reality is they are E.F.B. There are a number of compelling linguistic associations between the letter L and Jesus that likely prompted Elgar to use it as a cryptic reference to his Lord. For one, the letter L is the phonetic equivalent of the Hebrew word for Lord and God (El), and the first two letters in Elgar's last name. In Greek the letter L is known as Lambda, a title that may be interpreted as an oblique reference to one of the titles for Christ as the Lamb of God with the final two letters (da) forming the reverse acronym of the equivalent Latin title Agnus Dei. In ancient Egyptian hieroglyphs, L is represented by a reclining lion or sphinx. In Elgar's Roman Catholic tradition, one of the titles for Jesus is the Lion of Judah. As an aside, it is intriguing that in a letter from November 1899 Jaeger describes Elgar as a sphinx, a mythical creature infamous for posing insoluble riddles. Another compelling reason why Elgar used the letter L as a reference to Christ is the Turin Shroud contains four distinctive L-shaped burn hole patterns. As I explain here, the Turin Shroud was a tremendous source of inspiration for Elgar when he composed the Enigma Variations. By means of the diverse linguistic associations with the letter L, Elgar efficiently alludes to Christ as Lion, Lamb, and Lord. Proof that Variation XIII is secretly dedicated to Jesus is found in the first measure of the Enigma Theme using an ingenious Music Box Cipher that produces the plaintext solution gsus, a phonetic spelling of Jesus. It is noteworthy this phonetic spelling begins with the seventh letter of the alphabet, a number associated with the divine and the Sabbath, the seventh day. In scripture one of the many titles for Jesus is Lord of the Sabbath. Is this what Elgar implied when he wrote regarding the Enigma Theme that the seventh should be observed? Is this not an allusion to the scriptural injunction to observe the Sabbath and keep it holy? The second measure produces the plaintext solution grts, the phonetic spellings for the Latin words gratus (beloved), gratias (thanks), and gratis (free, grace). The terms beloved, thanks, free and grace are all used to describe Jesus Christ in the New Testament. With such evidence, how could anyone doubt Jesus is the hidden variant? Some will dismiss this conclusion because the Enigma cipher does not appear in Variation XIII, while others may question the legitimacy of the Enigma cipher discovery. Fortunately, there is confirmation in the form of a second cipher in Variation XIII that compliments and reinforces the integrity of the Enigma cipher. It is called the Romanza cipher. Following the discovery of Ein feste Burg as the missing Principal Theme, I detected a number of intriguing parallels between the principal theme’s standard three-word title and the three Mendelssohn quotations. There are three Mendelssohn fragments with a total of twelve notes enclosed in quotations. The original title of Mendelssohn’s concert overture is three German words with a total of twelve letters (Meeresstille und glückliche Fahrt). Ein feste Burg is made up of three German words and twelve letters. I reasoned Elgar devised a musical cipher in Variation XIII based on these parallels, but one distinctly different from the Enigma cipher. With his musical checkerboard cipher, plaintext letter solutions are compiled based on a specific sequence of melody/bass note pairings. In the Romanza cipher, letters are not added, but eliminated. 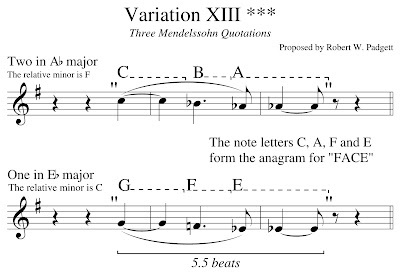 The use of quotation marks to enclose the Mendelssohn fragments is reminiscent of the double bar found at the end of measure six in the Enigma theme. Quotation marks are formed by two contiguous apostrophes, something analogous to parallel double bar lines. 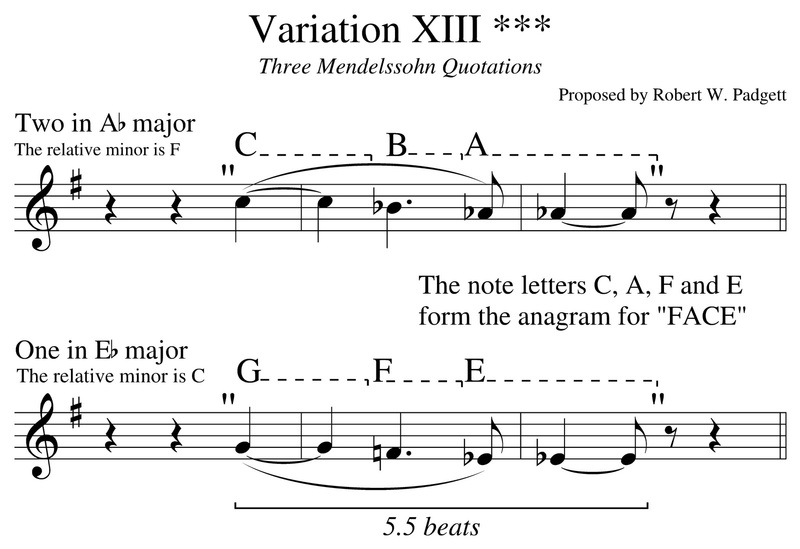 Two of the Mendelssohn quotes are in A flat major, and each consists of four notes each (C, B-flat, and two A-flats). The third quote is played a perfect fourth lower in E flat major, and it is made up of four notes (G, F, and two E-flats). Hence there are three sets of four notes in two different keys exactly a fourth apart for a total of twelve notes enclosed in quotations. It is interesting the first interval formed on the fourth note of Ein Feste Burg is a perfect fourth. The number twelve is a theologically significant because of such Biblical examples as the twelve tribes of Israel, and the twelve disciples. 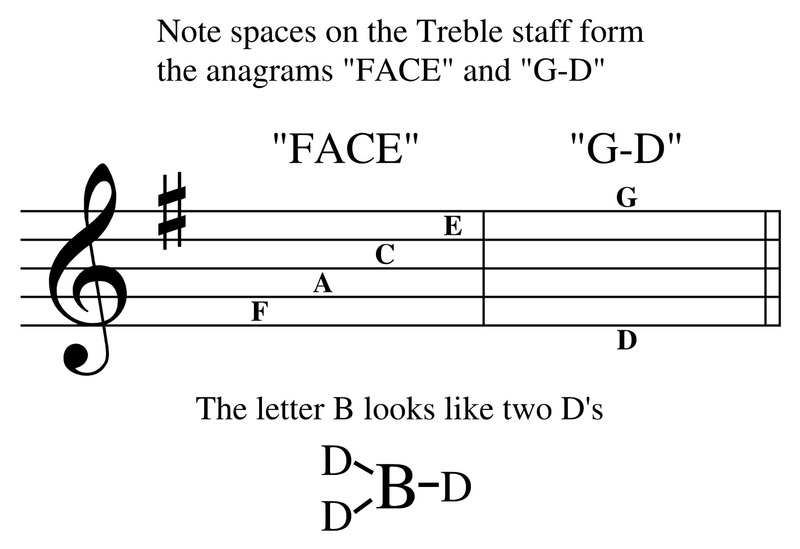 Among these twelve notes there are six discreet note letters: A, B, C, E, F and G with the D conspicuously absent. This mirrors the deliberate use of six note letters in the melody and bass of the first six letters of the Enigma cipher. Elgar dedicated the majority of his works to God using the Latin acronym A.M.D.G. (Ad Majorem Dei Glorium) with the letter D representing Dei, the term for God. The missing D presents a subtle allusion to the belief in the hidden God (Dei) mentioned in the epigraph. More intriguingly, the discreet note letters furnish six of the twelve letters in the title Ein feste Burg, specifically the first letters of each word, and the last letters of feste and Burg. This leaves six letters remaining, and the basis of the Romanza cipher. The Romzana cipher is an elimination cipher in which letters from the Principal Theme’s title are crossed out if they match any of the note letters from the Mendelssohn quotations. Such a process of “crossing” out letters undoubtedly appealed to a practicing Roman Catholic like Elgar. The remaining letters constitute the solution or plaintext letters. Table 5.1 identifies matching letters in bold type from Ein feste Burg and crosses them out of the Principal Theme’s title. By assigning the numbers 1 through 4 sequentially to the letters in the title, it is significant only those letters in the first and fourth positions are eliminated by this cipher. Such a consistent pattern supports the conclusion these letter matches were deliberate and methodically planned out. Since the Enigma theme is in reality the first variation, the first and fourth positions spell the number for this movement (14). The numbers 1 and 4 add up to 5, the numerical equivalent of the letter E, the first letter in Elgar’s first and last names. In reverse order the 4-1 spells the plagal or amen cadenced (IV – I), something that occurs twice in the Enigma Theme (measures 6-7, and 16-17), and once at the very end of Variation XIII (measures 52-53). Such a confluence of coincidences suggests an order of magnitude far greater than that permitted by chance of subjective interpretation. After eliminating matching letters, those remaining are I, N, S, T, U, and R. The first three solution letters spell the Latin acronym INS for “In Nomine Sanctus” (In the Holy Name). As previously pointed out, the holy name of Jesus was unmasked in the first bar of the Enigma cipher. The letters TUR form the anagram TRU for the phonetic spelling of the word “true.” Here is another parallel with the Enigma cipher riddled with phonetic spellings. The use of the word “true” in relation to Christ is theologically justified because Jesus said, “I am the true vine, and my Father is the gardener.” He also stated, “I am the way, the truth, and the life.” Even more amazing is the fact the full compliment of six plaintext letters spells the anagram TURIN S. This undoubtedly is a veiled reference to the Turin Shroud, furnishing yet another mutually reinforcing piece of evidence between the Enigma and Romanza ciphers with one mentioning Jesus, and the other citing his burial shroud. When the amateur photographer Secondo Pia took the first official photograph of the Turin Shroud in March 1898, he made a startling discovery. 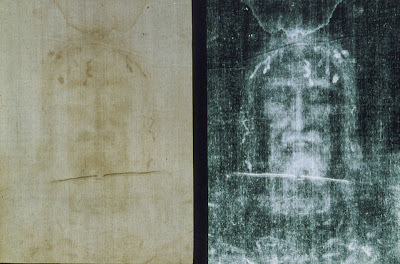 The image on the shroud only becomes clearly visible when photographed and viewed on the negative. Elgar began composing the Enigma Variations six months after Pia took his famous photograph that was widely reported in the general press and Catholic media. The photographic negative of the Turin Shroud were widely distributed to the public as part of the pious Devotion to the Holy Face of Jesus. The number six has turned up many times during this investigation, and this is yet another example of this phenomenon. According to many prominent researchers, the Shroud of Turin is the burial cloth of Jesus that miraculously captures the moment of his resurrection in the form a photographic negative millennia before the technology was ever conceived by humanity. To this day science has failed to provide a convincing explanation for the image on the shroud, particularly since it demonstrates a knowledge of photography millennia before that technology even existed. Recent research confirms the image on the Turin Shroud cannot be replicated by modern science. The Sanctus is a hymn of praise from the Christian liturgy sung or recited at the end of the Preface of the Eucharistic Prayer for the consecration of the bread and wine. The Sanctus begins “Sanctus, sanctus, sanctus Dominus Deus Sabaoth” (Holy, holy, holy, Lord God of Sabaoth). In Nomine has a distinct historic reference, one relevant to the early development of English music. “In Nomine” is a sizable body of English music composed during the sixteenth and seventeenth centuries by composers like Christopher Tye, Thomas Tallis, William Byrd, Orlando Gibbons, William Lawes, and Henry Purcell. It is the most prominent single form in the early stage of English consort music. This genre was inspired by a six-voice mass composed by John Traverner before 1530 based on the plainchant Gloria Tibini Trinitas. A popular passage from the Benedictus section of this work uses the Latin text “in nomine Domini”, and soon became the basis for a variety of arrangements over the next 150 years. In Nomines are usually consort works requiring four of five instruments, especially viols (the precursor of modern stringed instruments). The connection with In Nomines is relevant because the accompaniment for the clarinet solos in A flat is supplied by the violas, a cello solo, and a haunting timpani roll imitating the low hum of a steamer’s engine. The orchestral accompaniment consisting predominantly of violas alludes to this style of music, and thereby indirectly to In Nomine Sanctus – the Holy Name. The appearance of the anagram “Turin S” produced by the Romanza cipher seals the case for Christ as the hidden friend. In addition to this overwhelming evidence, there are other subtle references to Jesus embedded within Variation XIII. Consider the Roman numeral for this movement. X is the Roman numeral for 10, and the tenth letter in the alphabet is J. The Roman numeral for three is III, and the third letter in the alphabet is C. The Roman numerals for Variation XIII spell “JC,” the initials for Jesus Christ. I must admit feeling extremely embarrassed this unsubtle allusion to Jesus evaded my notice until only after I unraveled the Enigma and Romanza ciphers. How could I have overlooked something so obvious? The Roman numeral XIII also contains the XI monogram, an ancient type of Christian monogram derived from the first letters of the Greek names for Jesus (Ιησους) and Christ (Χριστος). The XI monogram (also known as the IX monogram) appears in the title of Nimrod, G.R.S., B.G.N., and E.D.U. for a total of five of the variations. 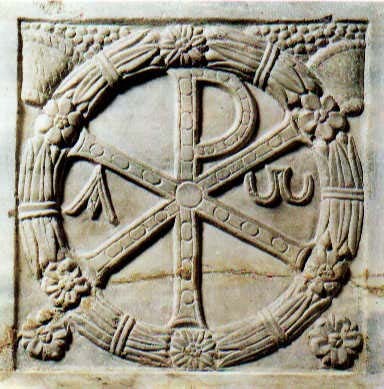 Another ancient and well known Christogram found in the title of Variation XIII is the Chi Rho, also known under the Latin title as the Labarum. The earliest known sketch of Variation XIII is marked with a solitary capital L, the first letter in Labarum. This ancient Christogram is called the Chi Rho because it comes from the first two Greek letters of the word “Christ” (ΧΡΙΣΤΟΣ, or Χριστός). The complete title of variation thirteen is “Variation XIII *** Romanza.” The “Chi” is graphically portrayed by the X, and the Rho is phonetically captured by the first two letters of the subtitle Romanza. It is fascinating the letter L is phonetically linked to the Hebrew word for God because it is the phonetic equivalent of El (אל), a title for God or a diety. El is the root wood of the Hebrew titles El Shaddai (God Almighty) and Emmanuel (God with us). Emmanuel is one of the names for Jesus. The terms Christogram and cryptogram sound very similar to one another. Is this perhaps one of Elgar’s japes? Jesus spoke in parables, ‘dark sayings’ that entertained but whose deeper message eluded the grasp of many listeners. The subtitle Romanza reinforces this conclusion because the Romans crucified Jesus, and the Roman numerals for this ominous sounding variation graphically portray a cross (X) and three nails (III), or the three days Christ was entombed. Interestingly, the English word crucifixion contains one x and three i’s. An Edwardian restraint may have contributed to this hidden dedication, but it is hardly surprising considering the majority of his works were openly dedicated to God with the Latin abbreviation A.M.D.G. This stands for Ad majorem Dei gloriam, the motto of the Society of Jesus meaning “For the greater glory of God.” This society was founded by St. Ignatius of Loyola, and is more commonly known as the Jesuits. 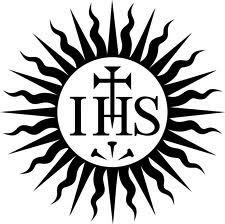 With their strong esprit de corps, Jesuits are nicknamed “God’s Marines”. The marine atmosphere of Variation XIII possibly alludes to this well-known nickname. One intriguing observation about Elgar’s choice of keys for the Mendelssohn fragments (F, A and E) is they allude to a well-known work for violin and piano called the F-A-E Sonata. This four movement piece is dedicated to Joseph Joachim, a famous violinist from the nineteenth century who championed the music of Schumann and Brahms. The F-A-E Sonata was a collaborative work by Robert Schumann, Johannes Brahms, and Schumann’s pupil, Albert Dietrich. The letters F-A-E are an acronym for Joachim’s personal motto, “Frei aber einsam” (“Free but lonely”). The sonata was composed based on a musical cryptogram using the notes F, A and E to represent the initials of Joachim’s highly romanticized motto. Dietrich composed the first movement in Sonata form, Schumann an Intermezzo for the second movement, Brahms a Scherzo for the third movement, and Schumann a Finale for the fourth. It is hardly a coincidence that Schumann’s contributions match the titles given for two movements of the Enigma Variations: Intermezzo and Finale. Elgar's allusion to Schumann could not be more apparent. That the motto was in German serves as another clue about the language used in the original title of the missing Principal Theme. The Mendelssohn quotations performed by the clarinet portray the deathly stillness of the sea as described by Goethe in his poem Calm Sea and Prosperous Voyage. Does the poetic marine imagery and orchestration place any particular emphasis on the letter C? The answer is an emphatic yes. The word clarinet begins with the letter c, and the sonic pictorialism of the sea conveys the phonetic equivalent of that same letter as the word sea sounds like the pronunciation of the letter C. The unique orchestration employed by Elgar places particular emphasis on that very same letter. 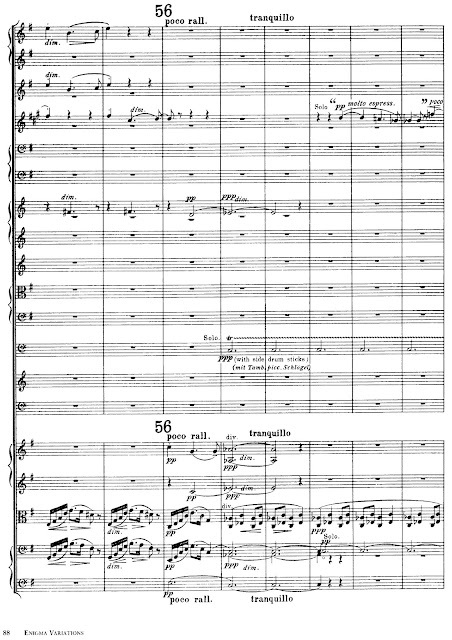 The clarinet solo four measures after rehearsal 56 begins on C, the viola ostinato continually plays C, a cello solo plays a harmonic C, and the timpani rolls on C. This is the first letter in the words Christ and cross, and the sonic pictorialism portrays a ship crossing the sea. For a Roman Catholic like Elgar, the term crossing conveys more than one meaning and is rich with spiritual symbolism. Elgar made two puzzling comments about the dedicatee to Variation XIII that seem to rule out Jesus as the hidden dedicatee. In the first he wrote the ”pretty Lady is far away and on the Sea…”; in the second he said “the asterisks take the place of the name of a lady who was, at the time of the composition, on a sea voyage.” How could these remarks possibly be linked to Jesus? In the 1870s and 80s, he composed an assortment of works for the Roman Catholic Church. His best known pieces from this era are Ave verum corpus, Ave Maria, and Ave maris stella from 1887. Ave Maris Stella is Latin for "Hail Star of the Sea", a Vespers hymn to the Virgin Mary dating back to as early as the eighth century. An ancient, popular title for the Virgin Mary is “Our Lady, Star of the Sea,” and captures the belief Mary is a guide and protector for those traveling on the sea. 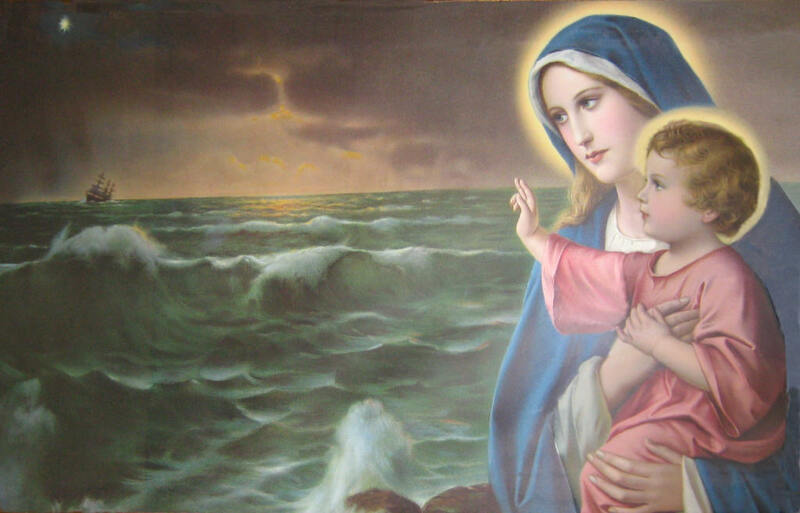 Many Catholic Churches in coastal communities are named Stella Maris or Mary, Star of the Sea. Elgar’s perplexing references to a Lady far away and on the sea is most likely a reference to the Virgin Mary as the Star of the Sea. A star is far away and over the sea, serving as a guide for sailors. Neither Lady Lygon or Helen Weaver were at sea during the time the Enigma Variations were composed. According to his Catholic faith, Elgar believed Lady Mary was indeed far away and on the Sea serving in her special role as Maris Stella when the Variations were composed. It should be noted Elgar never said the Lady was on a ship. The reference to Lady Mary is a subtle yet powerful link to the hidden friend for Variation XIII because she is the mother of Jesus. "You are my friends if you do what I command. I no longer call you servants, because a servant does not know his master's business. Instead, I have called you friends, for everything that I learned from my Father I have made known to you." After Jesus had died on the cross, he was pierced in the side by a spear releasing a mixture of blood and water from the wound. Water in this instance was symbolic of God’s judgment, yet also of His love and sacrifice for humanity. After considering these things, the Roman numerals for Variation XIII may be interpreted this way: The X represents the cross, and the three I’s symbolize the nails used to crucify Jesus - God’s human incarnation on earth. The three I’s may also be viewed as representing the three days Jesus spent in the tomb before his resurrection. 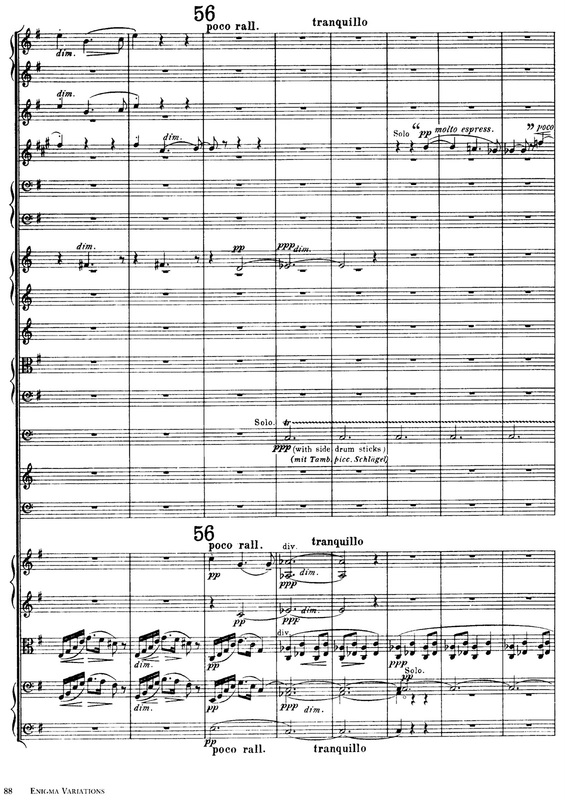 That Elgar called for silver coins to be used on the Timpani in this variation suggests this interpretation because Jesus was betrayed by one of his own for 30 pieces of silver. When contemplated from this perspective, Mendelssohn’s fragment assumes a much deeper spiritual meaning as it pertains to God’s love and willingness to sacrifice His only Son for the world. Martin Luther drew inspiration from Psalms 46 when he composed A Mighty Fortress, and he borrowed extensively from that Psalm for the lyrics. In them are multiple references to water, i.e., a raging sea, and a still river. As a final observation, the word Romanza consists of 7 letters. Professor Ian Parrott, a former vice-president of the Elgar Society, postulated the “dark saying” and the Enigma related to 1 Corinthians 13:12. In the Latin Vulgate it reads “videmus nunc perc speculum in enigmate tunc autem facie ad faciem nunc cognosco ex parte tunc autem cognoscam sicut et cognitus sum.” The authorized translation is, “For now we see through a glass, darkly; but then face to face: now I know in part; but then shall I know even as also I am known.” Ian Parrott’s analysis was much more prescient than perhaps anyone realized until now. One week after Elgar’s death a memorial service was held at Worcester Cathedral where the London Symphony Orchestra performed the Enigma Theme and three of the Variations: I (C.A.E. ), IX (Nimrod), and XIII (***). The selection of Variations I and IX make sense, but the choice of XIII is less certain. Patrick Turner explains, “On one level, the choice of ‘***’ can be understood because the music evokes a long journey, thus echoing the ‘Proficiscere, anima Christiana’ (Go forth upon they journey, Christian soul) from the Dream of Gerontius, which was also performed as part of the memorial service.” This is reminiscent of a passage in the New Testament in which Jesus tells Simon shortly before his crucifixion, “Where I am going you can't follow now. But you will follow me later." On February 23, 1934, Elgar went the way of all the earth and followed his Lord to the grave and his eternal reward. Praise God in his sanctuary; praise him in his mighty heavens. Praise him for his acts of power; praise him for his surpassing greatness. Praise him with the sounding of the trumpet, praise him with the harp and lyre, praise him with tambourine and dancing, praise him with the strings and flute, praise him with the clash of cymbals, praise him with resounding cymbals. Let everything that has breath praise the LORD. The first full performance of Elgar's Enigma Variations in its final version was given at Worcester’s Anglican Cathedral in 1899. Many have struggled to understand the ominous nature of the music found in Variation XIII. Given the mixture of deathly stillness and a subtitle invoking love, Elgar’s music captures the romantic Christian ideal of the tragic connection between love and death: Liebestod. When Elgar described his Enigma as a “dark saying,” he quoted directly from the Latin Vulgate, 1 Corinthians 13:12. This is the famous “love” chapter from the New Testament. It is more than mere coincidence that Elgar’s description of the Enigma contained a veiled reference to one of the most famous chapters in the Bible, one often read at weddings and made up of 13 verses — the same number as that enigmatic variation. In addition, there are 14 descriptions of love in that chapter, the identical amount as the variations. As the subtitle Romanza implies, Elgar’s friend pictured within is “Love,” and 1 John 4:16 plainly declares, “God is love.” This link is reinforced by the various melodic conjunctions between the hidden melody, the Enigma Theme, and the Morse code pattern I M M I which suggest the great double “I AM” from the book of Exodus. Elgar’s faith in the triune God is also implied by the number of this variation – 13 – the belief of “three in one.” The identity of Elgar’s hidden friend could be none other than God as embodied by His only Son Jesus, the purest embodiment of “love” in the Christian canon of faith. That Elgar identified this variation in his early sketches with the letter “L” may be viewed as shorthand for Lion, Lamb, and Lord. The first two notes of the melody for Variation XIII are G and D, a phonetic spelling for God. To learn more about the secrets of the Enigma Variations, read my free eBook Elgar’s Enigmas Exposed. Rushton, J. (1999). Elgar: ‘Enigma’ Variations (Cambridge Music Handbooks) New York: Cambridge University Press, p. 8. Reed, Nicholas. Elgar’s Enigmatic Inamorata, The Musical Times 125 (August 1984), pp.430-4. Parrott, I. (1977). Elgar (‘The Master Musicians’). London: J M Dent & Sons Ltd, pp. 46-49. Interestingly, the Latin abbreviation A.M.D.G. 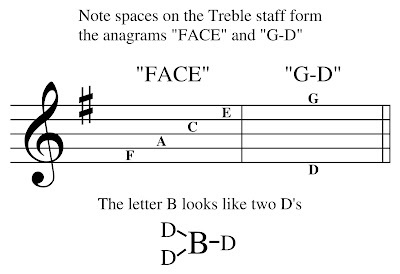 contains three of the string names for the violin (A, D, and G). The fourth letter (M) may be viewed as a capital E turned sideways, thus accounting for the remaining E string. Elgar considered the violin his primary instrument, and his use of this Latin abbreviation is likely connected to it in this manner. Rushton, J. (1999). Elgar: Enigma Variations (Cambridge Music Handbooks) New York: Cambridge University Press, p.52.